This Saturday my Aunt LeAnn and Uncle Ron took me on a 14km hike around Waterton National Park. At first I was a little skeptical about the whole idea, but looking back on it I am so grateful they invited me and glad I went. The weather was absolutely perfect. There was never more than a gentle breeze which conveniently occurred when we were out of the trees and exposed to the sun. The hike itself wasn’t extremely difficult, but it was long enough that my legs were quite fatigued by the time it was over. I found it fairly impressive that my Aunt and Uncle did the whole thing without really taking a break, except for lunch, which was delicious by the way. I do not remember the names of the places we visited, but I’ll very briefly poorly summarize where we went. 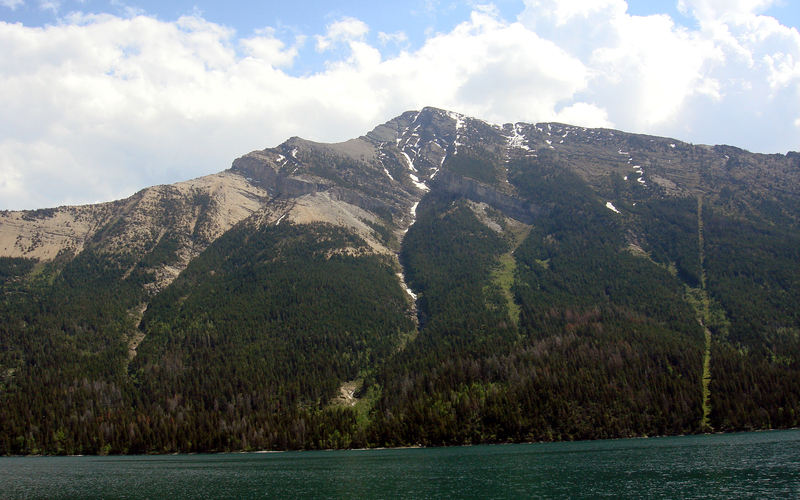 We started out in the town of Waterton, and hiked around the right side of the lake. The beginning was the most difficult part as it was quite steep. We then descended down to a bay. I believe it was about 7km into the hike when we reached the Canada-US border. Interestingly, there is about a 30ft wide path cut the all the way up and over the mountain indicating the divide (to the right of this image). As a Canadian, it was nice to see our side of the hike was maintained much nicer. That’s not to say the Montana side wasn’t nice, it was indeed very beautiful. The hike was finished off with a boat ride on the “International” back to Waterton, where we had some ice cream. I had peaches and cream flavored. It was good. Then it was back to Lethbridge where I took a look at the 240+ photo’s I had taken. I think I was doing my “geek” stance here… That bridge was pretty wobbly! Below is about 40 of my favorite pictures from the trip. I am trying out a new way to display them. If you liked how my last photolog loaded images instead, and you use Firefox, you can get a very similar result by middle-clicking the photos instead of left clicking. All the images are 1920×1200 with the exception of a few which are 1200×1920. If you’re wondering, I take the photos off of my camera at a 10MP resolution and then resize them and retouch the color levels if need be.